This entry was posted in A to Z, Cooking, Food, Viet Nam and tagged dưa món, Huế, tamarind, Tết, Tết preserves, trái vả, Vietnamese food. Bookmark the permalink. I love the way you juxtapose the cooks’ labouring fingers with the final thrill of taste on the tongue. Love the pictures! Could you add something to make the preserves more sour, too? You’ll have to let us know whether your mother-in-law agrees on the chilis! I imagine some people use more vinegar and less sugar. Either way, it’s not a fave of mine. Unfortunately, no chilis! Darn! Don’t think I’ve ever seen, never mind eaten, a tamarind. Interesting how many vegetables are picked or bottled. People here used to make pickles and chutneys, and bottle fruit in kilner jars, but I guess most people nowadays, if they have excess fruit or vegetables, tend to freeze them. So all the interesting recipes have been lost. Your mother-in-law must be kept extremely busy with all this work. Preparing the tamarinds seems to be very tedious work. She must be pleased to have help. Ripe tamarinds are dark brown and sweet. And easy to peel, because the pods become brittle. The fruit inside changes from crisp to soft, almost like a prune in texture. 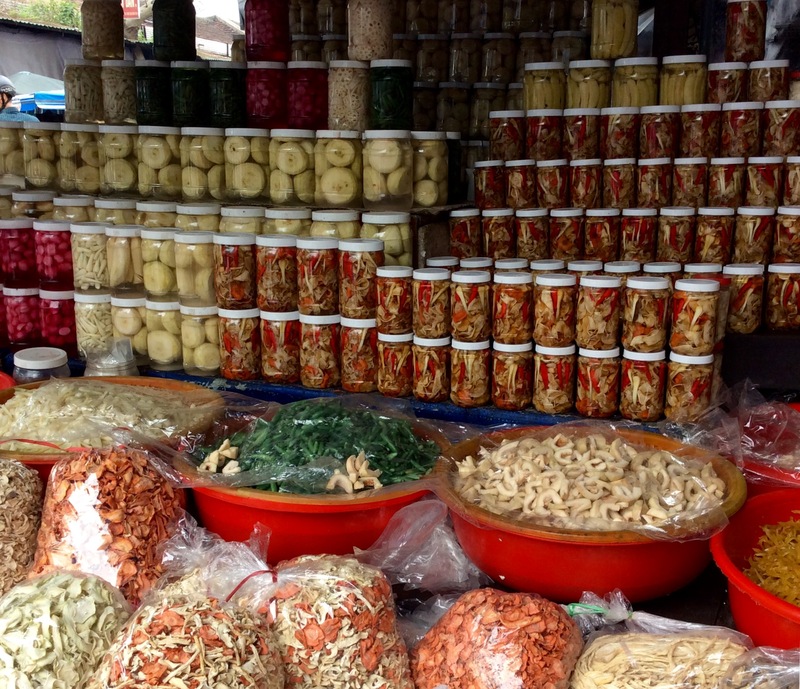 People in Viet Nam are making fewer preserves than before too, preferring to buy them instead because no one has time for all the work involved anymore. And you are spot on–this is incredibly tedious work. Not something I would choose to do. So many other Tet preserves are easier to make. Having helped make, and having tasted, the genuine article, then your tastebuds will know if a bought product lives up to the true flavour. Too many people nowadays have nothing to compare fast food with, so are happy to eat rubbish, one glance at the ingredients showing the quantity of artificial sweeteners, flavouring and colouring, as well as substitute ingredients in the product.